Click the banner for more stops! Good morning fellow bibliophiles, and happy Saturday! I have a wonderful book to spotlight for you today! One that, in my opinion, has the most swoon-worthy cover I've seen in a long time. 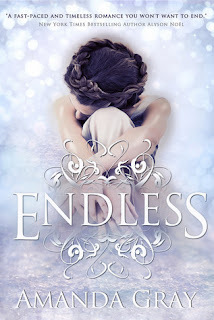 Amanda Gray is here today with her new book, Endless. Books that center around past lives have always intrigued me. I can't deny that the Romanov Russia aspect of it all just makes me want to devour this even more! Still on the fence? Please enjoy this wonderful excerpt from the book, then scroll down to enter to win a giveaway! Don't forget to add Endless to your reading list as quickly as you can! The remnants of the dream drifted through Jenny’s consciousness. She knew that it was morning, could feel the press of golden light against her closed eyelids, but she wasn’t ready to let go of the dream. She clung to it, trying to force herself back to the big room, the shoddily painted fruit on canvas, the guy who had pressed the paper into her hand. She could still feel his skin against hers, see his eyes burning into her own. Nikolai. That had been his name. But remembering it didn’t help. The dream was gone, and so was he. She gave up, opening her eyes and picking up her cell from the bedside table. Nine a.m.
She was exhausted, her eyes grainy and heavy. Not a great day to be tired. It might be the first day of summer, but she would be busy from the minute she stepped out of bed. She lay there for a few more minutes, thinking about the icy field and the progress she’d made the night before. By the time she’d finally stumbled to bed, the painting had felt perfect, but that was no guarantee. Sometimes a piece seemed just right in one light and all wrong in another. She was suddenly anxious to see it in the daylight, even though she knew it was too late to make any changes before the installation. She sat up, putting her feet over the side of the bed, but when she stepped down, something wet and cold touched the bottom of her right foot. “What the … ” she muttered aloud. The smell was unmistakable, but she touched her fingers to the sticky substance anyway, just to be sure. What was paint doing on the floor?